back in the 80s, computers were just about reaching the massmarket. 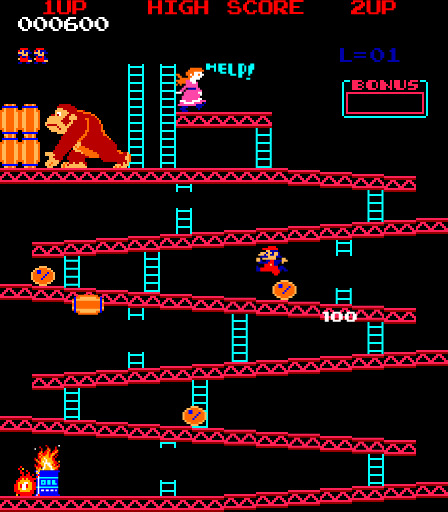 games like donkey kong and pacman saw heroic characters rescuing damsels in distress (rarely the other way round until lara croft) by overcoming such everyday objects as ghosts, flying barrels and fireballs. this theme carried through to the music industry, where computers had provided a snazzy (80s word) way to keep up with the new mtv-ready requirement for singles to be accompanied by a video, by incorporating graphics and other such wizardry to demonstrate cutting edge mentality of artist in question. another way to display your futuristic sensibilities was to actually sing about computers. and act quite robotic and devoid of emotion. the computers were pulling the strings you see…and yet, according to this playlist, they apparently became a conduit for romantic relationships. i think in fact, that didn’t really start to happen until the mid 90s, but 80s people were optimistic. we didn’t personally have email and the ability to connect to other computers via the internet, but we knew it was happening and could see the possibilities. so, most 80s groups have a homage to the computer, or electricity (like that was a new phenomenon! ), in their back catalogue, much like the phone. of course its now all painfully out of date, and so a nice reminder of a simpler time when computers were cool, and people, not cyberspace, were still in charge. about as good as it gets for this post. built on a similar premise to the long-held view that we would be scooting around in our own little space bubbles, jetson style, by the year 2000.
vocoder work par excellence. in 1984 it was perfectly normal to be sung to by a robot, not a person. kraftwerk, as pioneers of electronic music, could have made up well over half of this playlist with their output. but this one was the most obviously titled. more recently bootlegged and sampled for the sugababe’s ‘freak like me’. again, most of gary numan’s output was future focused, so it was a toss up between this and ‘cars’. another vocoder led funk jam, about electricity, and energy, another favourite 80s theme. difficult to see how this could have sounded groundbreaking even in 1979. bet it was popular with the over 40s. archetypal mid 80s teen movie fare. human league of course, were a natural choice to record the title soundtrack, with their synth pop credentials. title song from the soundtrack to the definitive 80s computer geek movie. doesn’t sound particularly futuristic now but surely create-a-girlfriend is still the ultimate geek fantasy? the then-pioneering electronic music and faux francais created an eerie soundscape, second only in the weirdness stakes to its own video. beverly hills cop theme which became the single most emulated tune on millions of casio and yamaha keyboards. to ease parent and teacher frustration perhaps manufacturers should have made this the demo tune instead of wake me up before you gogo. this song may or may not have been about being addicted to sticking your fingers in a plug socket. the state of five star’s hair in the accompanying video certainly supports this theory. don’t try it at home kids. prince, as usual, managed to make music that was both futuristic and would hold up in years to come. prince has a love interest, computer says no.